Early one morning, as I was practicing my spiritual devotions, I saw this written in the Bible: “At that time Jesus went on the sabbath day through the corn; and his disciples were an hungered, and began to pluck the ears of corn and to eat. But when the Pharisees saw it, they said to him, Behold, your disciples do that which is not lawful to do on the sabbath day. But he said to them…. But I say to you, That in this place is one greater than the temple. But if you had known what this means, I will have mercy, and not sacrifice, you would not have condemned the guiltless. For the Son of man is Lord even of the sabbath day” (Matthew 12:1–3, 6–8). After reading this passage, I fell into deep thought: “In the Age of Law, Jehovah instructed the common people to keep the Sabbath. On the Sabbath day, the common people were to stop all work; if they did not stop work on that day, then that would be a sin, and they would have to be dealt with. 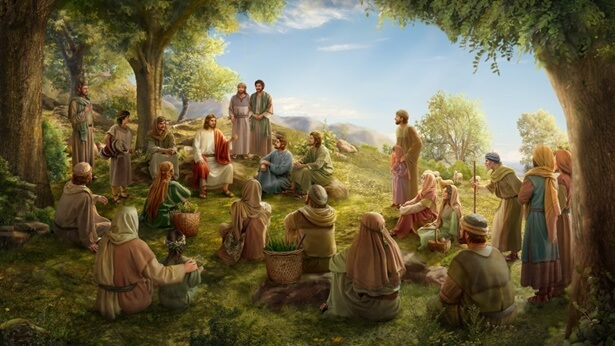 When the Lord Jesus came to perform His work, He no longer kept the Sabbath day, but instead He led the disciples to various places to preach the gospel and to work. Why was this? What warning does the Lord Jesus doing this hold for us?” I pondered this for a long time, but still I didn’t understand. Several days later, I heard that Co-worker Xue had returned from a trip to hear sermons, and so I went to visit her at her home. She cheerfully shared with me what she had gained from listening to sermons and she took out a book. She said the book revealed many truths and mysteries that had never before been heard. She said that she’d read much of the book, that the more she read it, the more light filled her heart, and that she had come to understand many truths which she had not previously understood. After listening to Co-worker Xue, I kept thanking God’s preparations with all my heart, and I couldn’t stop myself from telling her about what had been perplexing me over the past few days. Smiling, she said to me, “Thank the Lord. This book speaks very clearly about the issue of why the Lord Jesus worked on the Sabbath day. Let’s look at it together.” As she said this, she opened the book and let me read. I read: “When the Lord Jesus came, He used His practical actions to communicate to people: God had departed the Age of Law and had begun new work, and this new work did not require observation of the Sabbath; when God came out from the confines of the Sabbath day, this was just a foretaste of His new work, and His truly great work was continuing to play out. When the Lord Jesus began His work, He had already left behind the shackles of the Age of Law, and had broken through the regulations and principles from that age. In Him, there was no trace of anything related to the law; He had cast it off entirely and no longer observed it, and He no longer required mankind to observe it. So here you see that the Lord Jesus went through the corn fields on the Sabbath; the Lord did not rest, but was outside working. This action of His was a shock to people’s conceptions and communicated to them that He no longer lived under the law, and that He had left the confines of the Sabbath and appeared in front of mankind and in their midst in a new image, with a new way of working. This action of His told people that He had brought with Him new work that began with going out from the law and going out of the Sabbath. When God carried out His new work, He no longer clung to the past, and He was no longer concerned about the regulations of the Age of Law. Neither was He affected by His work in the previous age, but He worked as usual on the Sabbath and when His disciples were hungry, they could pick ears of corn to eat. This was all very normal in God’s eyes. God could have a new beginning for much of the work that He wants to do and the things that He wants to say. Once He has a new start, He neither mentions His previous work again nor continues it. For God has His principles in His work. When He wants to begin new work, it is when He wants to bring mankind into a new stage of His work, and when His work has entered a higher phase. If people continue to act according to the old sayings or regulations or continue to hold fast to them, He will not remember or praise this. This is because He has already brought new work, and has entered a new phase of His work. When He initiates new work, He appears to mankind with a completely new image, from a completely new angle, and in a completely new way so that people can see different aspects of His disposition and what He has and is. This is one of His goals in His new work. God does not hold on to the old or take the beaten path; when He works and speaks it’s not as prohibitive as people imagine. In God, all is free and liberated, and there is no prohibitiveness, no constraints—what He brings to mankind is all freedom and liberation. He is a living God, a God who genuinely, truly exists. He is not a puppet or a clay sculpture, and He is totally different from the idols that people enshrine and worship. He is living and vibrant and what His words and work bring to humans is all life and light, all freedom and liberation, because He holds the truth, the life, and the way—He is not constrained by anything in any of His work. … Thus, the Lord Jesus could openly go out and work on the Sabbath because in His heart there were no rules, and there was no knowledge or doctrine that originated from mankind. What He had was God’s new work and His way, and His work was the way to free mankind, to release them, to allow them to exist in the light, and to allow them to live” (“God’s Work, God’s Disposition, and God Himself III”). Previous：What Is God’s Will Behind the Parable of the Master and Servant? Next：What Kind of People Are the Poor in Spirit (Matthew 5:3)?